You know, I love rituals, especially when celebrations are to my heart and the events are flexible enough to put my own twist to the customs. I believe that we love to follow rituals or customs more, when we see our elders following them without any compulsion or inequality. Spoke with Mom-in-Law, and came to know that today is Jamai Shoshthi (Jamai-Shasti). I really have not much idea about this occasion, but when in Calcutta, have seen my Mom-in-Law inviting her son-in-law and preparing a rich sumptuous meal for everyone. Yes! For everyone! 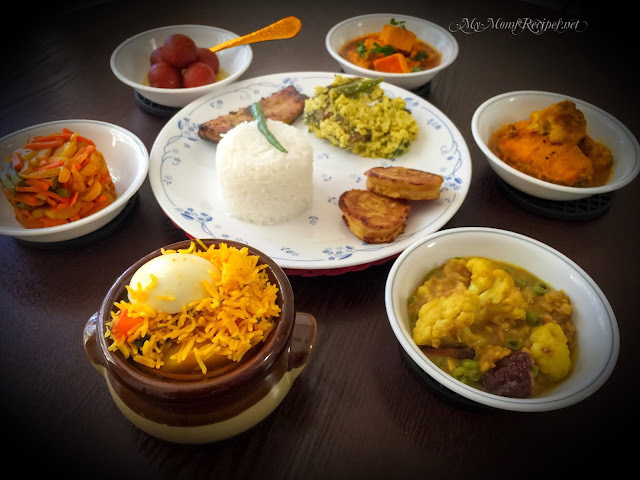 The best part is when she asks her daughter and son-in-law as well as her son and daughter-in-law(me) to sit and enjoy her specially made Bengali delicacies. This togetherness makes every ritual and custom more enjoyable and beautiful. The royal treat consists of all the best exotic recipes, that my Mom-in-law can prepare. 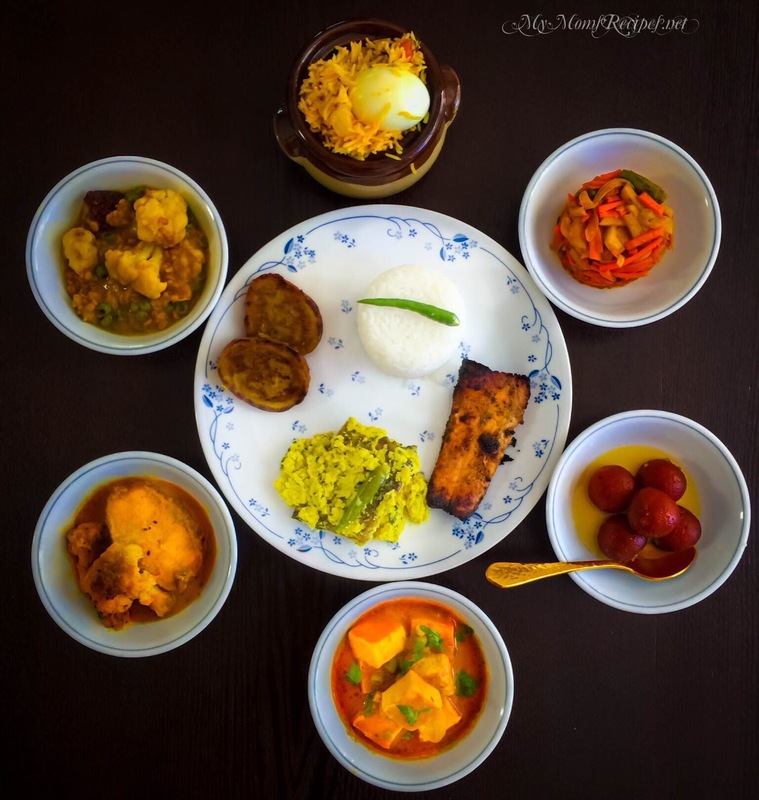 Once the feasting is over, the too-full-to-get-up-from-dining-table family members spend a substantial time in quintessential Bengali Adda (a gathering among family and friends.) After all the food and fun, son-in-law is also showered with gifts, mostly clothes or other items and sweets. Somehow I feel, this occasion of Jamai Shoshthi, which is celebrated at the height of summer, could be more enjoyable had it been held on a cooler winter day. 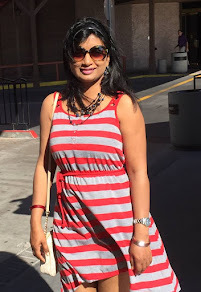 Rich Bengali food and sultry weather do not make and ideal pair !!! Leaving all the discussion apart, I must say this day shows the beautiful bonding between the "Shoshur Bari" in-laws with their Jamai "son-in-law." The common belief is that it is done for the welfare of their daughter and son-in-law and also to bring two families closer. In Calcutta, many of the famed restaurants celebrate this festival with their special menu named " Jamai Shasti Bhuri Bhoj"
As I said, I love rituals and also, I love to cook more than I love to eat. So thought of preparing a simple Bengali platter, with whatever I had in my refrigerator. Was not in a mood to step out. This Bengali platter, customized to the available ingredients, contains three types of fish, three veggie delicacies, few fritters and dessert. Rice - plain white rice is the main accompaniment to all the dishes. I prepared plain white rice and Egg Biryani too. Green Chilies(Kacha Lonka), a slice of Bengali Lime(Gondhoraj Lebu) and a pinch of Salt in the corner of plate is a trademark of traditional Bengali food serving. Starters - Fries (Bhajas) - Crispy vegetables deep fried with or without the batter. I prepared Potato Fritters. Posting this today without the detailed recipes of all my preparations today. Will soon update the post with every recipe. Tired enough for today.